Rand Paul Returns To Senate After Being Injured In Attack By Kentucky Neighbor : The Two-Way The GOP senator was at his home in Bowling Green, Ky., earlier this month when he was tackled by a longtime neighbor of 17 years after what has been described as a "trivial disagreement." Sen. Rand Paul, R-Ky., arrives on Capitol Hill in Washington on Monday. 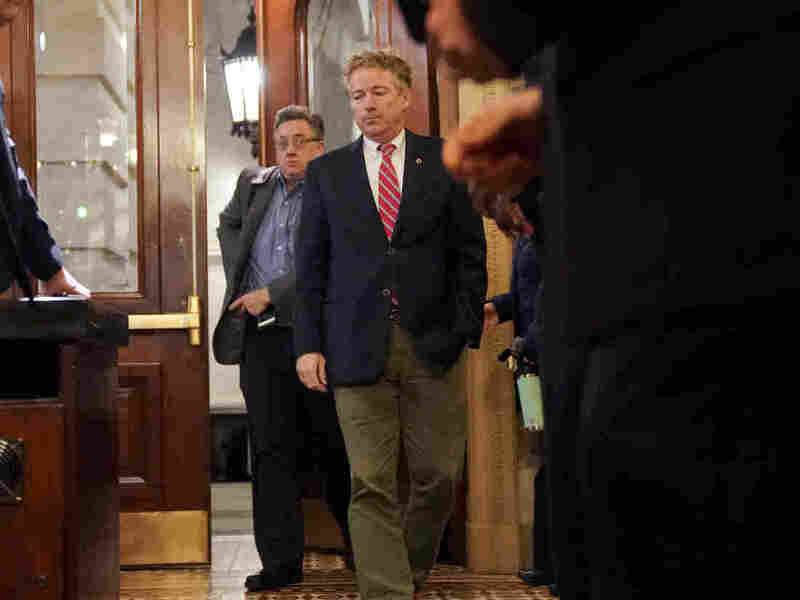 Sen. Rand Paul, who was allegedly tackled by a neighbor at his Kentucky home earlier this month causing him to break several ribs, returned to the Senate Monday for the first time since the attack. 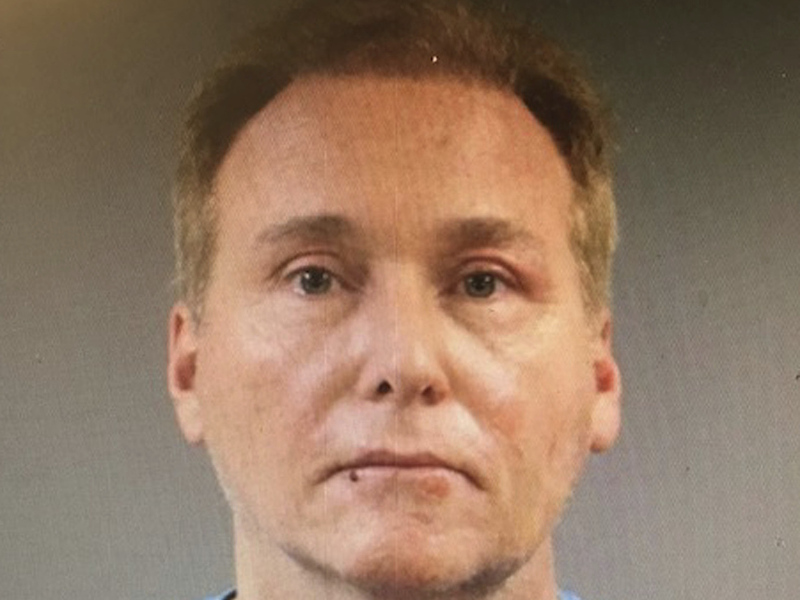 This photo provided by the Warren County Regional Jail shows Rene Boucher, who has been arrested and charged with assaulting and injuring U.S. Sen. Rand Paul of Kentucky. He has also hired a personal injury attorney, evidently with the possibility of pressing charges. As we reported previously, the GOP lawmaker described the attack, which allegedly involved the neighbor, Rene Boucher, 59, tackling Paul from behind, as "an unfortunate event." The attack occurred at Paul's Bowling Green, Ky., home. Boucher, who is a medical doctor like Paul, has been charged with fourth-degree assault. Paul returned to the floor of the Senate on Monday, casting votes with his arms at his side, The Associated Press reports. Kelley and I want to thank everyone once again for your thoughts and prayers for my recovery. While I’m still in a good deal of pain, I will be returning to work in the Senate today, ready to fight for liberty and help move forward with tax cuts in the coming days and weeks. He declined to answer questions from reporters about the assault, but tweeted: "While I'm still in a good deal of pain, I will be returning to work in the Senate today, ready to fight for liberty and help move forward with tax cuts in the coming days and weeks." USA Today reports Monday that Paul has hired Thomas N. Kerrick, a personal injury lawyer, in the wake of the incident and Kerrick's firm has confirmed the hiring. Matthew J. Baker, an attorney for Boucher, who is a registered Democrat, has described the episode an "unfortunate occurrence" between the neighbors of 17 years and insists that it "has absolutely nothing to do with either's politics or political agenda." "The dispute may have its roots in the senator's yard. Citing neighbors and local Republicans, The New York Times says that Paul "has long stood out in the well-to-do gated neighborhood," handling his yard according to his own ideas — the Times mentions pumpkins and compost — rather than following neighborhood rules. The Times also says that Paul's associates say he was set upon as he was getting off his riding mower. At the time, he was wearing ear protectors that kept him from hearing any sign of the impending attack, they say."